On Purpose Journey Inc. is an approved Charity of the United Way of Milwaukee and Waukesha Combined Giving Campaign. Code 1299. We appreciate your support! 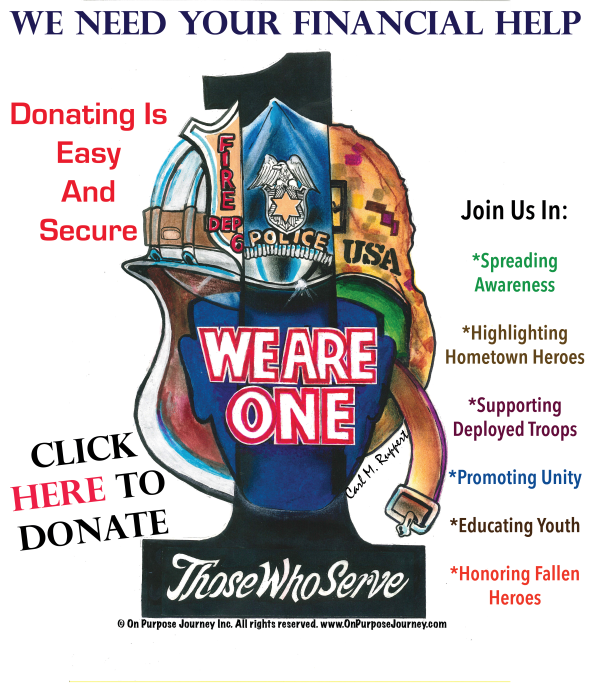 On Purpose Journey Inc. is also an approved Charity of the Combined Federal Campaign (CFC). Please donate to CFC Code 97433. Our Mission: Spreading awareness. Supporting deployed troops. Promoting UNITY for the CommUNITY. Partnering with those who serve to infuse passion, victory, and greatness into our neighborhoods. The CFC is the largest and annual workplace charity campaign, raising millions of dollars each year. Pledges made by Federal civilian, postal and military donors during the campaign season (September 1st to December 15th) support eligible non-profit organizations like On Purpose Journey Inc. which provide health and human service benefits throughout the world.